The first Marine CoLAB workshop of 2016 began by deepening the conversation about the values connecting people and the ocean. The group continued working on the vision, mission and strategy of Marine CoLAB through the lens of values and systems change. As part of the strategy conversation, the group specifically focused on examining the LAB approach, including the action research cycle as a possible framework for a learning lab. In the afternoon the scope and roles of the MarCoLAB Incubator were further clarified. The day ended with an update from the London SUP-B Free project. Finally, plans for the upcoming workshops (in February and March) have been sketched out, focusing on developing a workplan for 2016 and a long term operating and business model for Marine CoLAB. The CoLAB has impressive outputs so far, but more focused work is needed to bring implicit ideas to the surface and clarify what the LAB is about. What may be needed at the moment is something like a Stern report for the ocean (costs, benefits and cost of delayed action) as there is a window of a few years to press these issues internationally. It is time to pick up the pace and shape Marine CoLAB’s operating model. CGF is discussing the possibility of bringing in business consultants who may be able to translate the work of the CoLAB into a model with financial sustainability. Institutional buy in from within organisations remains a challenge - how can we find ways to share ideas and formally engage the organisations that the Marine CoLAB participants part of. We have begun discussing these questions, but haven’t reached any clear conclusions. The answers to the questions “who are we?” and “where are we going?” (the vision and mission of Marine CoLAB) both include values connecting people and the ocean at their core. Shared values, conflicting values, gaps between values and values in need of aligning are all challenges that can be tackled using a values based approach which can function as a lens to help select, design, communicate and evaluate Marine CoLAB and its activities, as well as being at the heart of a working theory of change (TOC) for Marine CoLAB. It hasn’t yet been decided whether there is one or more TOCs in Marine CoLAB, but it was generally agreed that it was important for the TOC to be context specific, in order to enable a diversity of voices. The values based approach should uncover, understand, recognise, align, amplify and enable a range of values that co-exist alongside the currently dominant economic valuing of oceans. This could lead towards a significant values shift and drive the behavioural changes needed to improve the health of oceans. 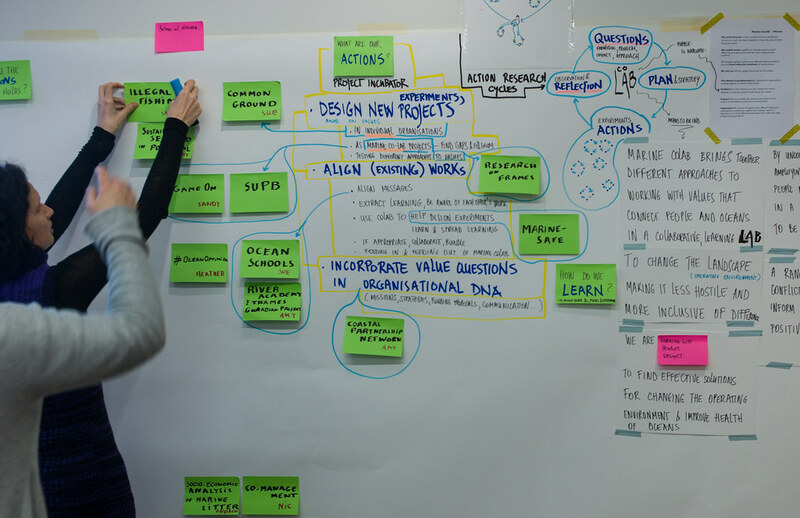 The value shift is an important element of the vision for Marine CoLAB, which would be achieved by applying a lab approach (continuous iterative feedback loops of questioning, experimenting, planing, connecting, etc.) in three focus areas: governance/policy, corporate and public awareness. The lab approach is deeply embedded in the strategy of Marine CoLAB as discussed during the previous workshops. 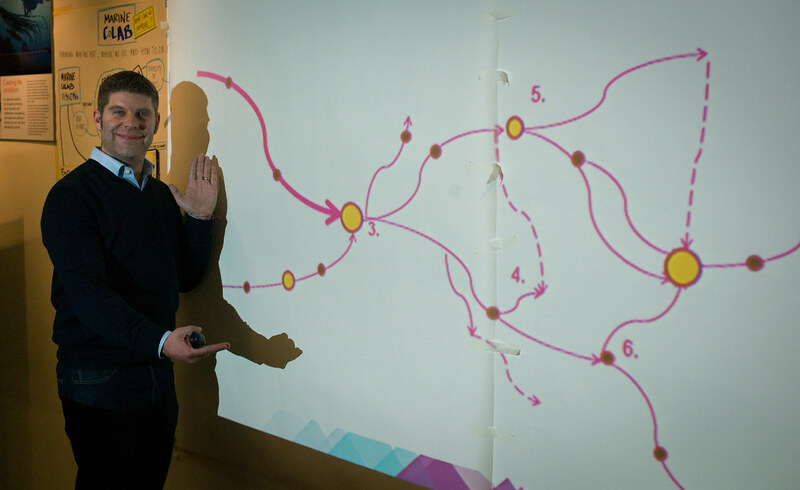 The CoLAB strategy is built on an experimental attitude of continuous exploration and learning. The change-making and change-showing projects designed, enabled and aligned by the MarCoLAB incubator are designed to be tested, replicated and adapted in different contexts. The CoLAB as a whole can be seen as an experiment in itself, as well as a collaborative environment in which to develop experiments to further the CoLAB’s mission. This includes looking at MPAs and marine planning, capacity building, communication, learning and education. There are currently 19 experiments in the MarCoLAB incubator (as documented) some of which are joint projects such as SUPB Free London or Game On, existing initiatives that can benefit from inclusion in the Lab (e.g. Blue New Deal, Common Ground), or project ideas which could become collaborative experiments (e.g. River Academy and Ocean Schools, or Sustainable Fishing in Portugal). This is the story until now, the place from where we continue today. We begin by clarifying values connecting people and oceans, beginning with the individuals in the group. We’ll attempt to find some shared patterns in the individual values and proceed to examine what the “values based approach” might mean in theory and practice for Marine CoLAB. We will look at the current versions of the vision and mission statements using values as a lens. Armed with a clearer understanding of “who we are” we will look at “where we’re going”, inquiring into what the CoLAB strategy might be like, and what activities might it develop as the MarCoLAB incubator. At the end of the day we will get an update from the most developed incubator experiment: the SUPB Free London. Marine CoLAB governance, operating and business models (for 2016 and beyond). What values illustrate heartfelt connections between people and the ocean? Mirella; a beach pebble from when she moved from London to live by the sea as a child, sound of the sea, waves over stones, shingles, background noise, a small stone as a connection to something that is bigger, more turbulent, powerful than the 'everyday'. what is the equivalent of 'finding a pebble in the pocket' for people? Aniol; octopus farm, the time as a child when he made an octopus farm during his holidays on costa brava, dropping building bricks at 3~4 metres depth as a place for octopuses to live. snorkelling. Sarah; photo from her kitchen table, a family holiday on the southern Turkish coast, near a Roman port, sand spit and a place for turtle nesting, and now a protected area for turtles which has increased its level of tourism. people in completely different attire and stages of life (from tiny bikinis to full burkas, the young and energetic, the frail and old). There have been more people in space than have crossed the pacific alone. Manuel; sea as psychological comfort, something he misses in London having grown up on the coast, something ineffable. The values based approach aims to uncover, understand, recognise, align, enable and amplify values to create significant change, a value shift away from the dominance of economic value of oceans, towards inclusion of a wider range of intrinsic and extrinsic (social and cultural) values that connect people and oceans; providing tools (e.g. legal frameworks, campaigns, etc) to do this would be a part of the Marine CoLAB approach. The long term goal could be to change the paradigm of a growth economy; in the shorter term it is important to look at ameliorating the current system to enable or amplify different existing values, thereby tempering the existing dominant values of 'cost to business' supported by extraction, exploitation, etc. Is valuing the ocean enough? is an economic approach necessary AND sufficient to value the ocean. There is a need to capture value in order to change things within the current system, improving things gradually. What values are required to do this? Both having the ambition to change the existing paradigm and gradually shifting values from within the current system can be included in a values based approach. Possibly “values based approach” isn’t the right term, perhaps instead say “work with the values people place on the ocean” or “work with the values that connect people and the ocean”. Hypothesis: By uncovering, understanding, recognising, aligning, enabling and amplifying values, people may change their behaviour in a way we consider to be positive. A range of possibly conflicting values can inform a set of coherent positive changes. How has participation in the Marine CoLAB benefited you so far? What outcomes has it had for you personally and/or professionally? What about for your organisation? Has Marine CoLAB had an effect on particular projects or initiatives that you are involved in? If so, which ones and how? What appears to be missing from the mission is an emphasis on the “LAB” aspect of the CoLAB – that it is a Laboratory for learning about how to create systemic change through a values based approach. i.e. why was this set up as a LAB as opposed to just a network or discussion group? etc. The LAB should be considered as a means to an end, and its purpose is to overcome the problem that current solutions aren’t creating the impact required to meet the scale of threats facing the oceans. In order to do that, there should be a more receptive operating environment for the organisations and their initiatives. The CoLAB could be an example of such an environment. This operating environment should allow different approaches and values to co-exist, there should be a willingness to co-operate, to work with values that connect people and oceans in order to enable positive actions. What is a Lab for system change? A lab is a place for people to collaborate, take action and learn together in order to create change. Action research cycle could be a framework to keep the focus of continual inquiry for the lab, and helps avoid a too narrow focus on specific projects. A CoLAB would include diverse perspectives, an experimental mindset, a robust process design and rigorous analysis to learn from the actions/experiments/projects developed in the lab. Questions and knowledge: What questions are you trying to address? What theories and practice already exist that might help us address these questions? For Marine CoLAB: What are the questions the lab holds? How to create change through values? We could take multiple approaches, drawing for us and others. Where are the gaps in our knowledge? What do we need to skill up? Plan and Strategy: How are we going to address these questions? What is our overall approach? How will we organise collaboration, action and learning? for Marine CoLAB: what are interesting new ways of doing things? Action (in the CoLAB these are the experiments): How are we creating change – what are the projects we want to learn from? What experiments should we be doing together? How do we incubate interesting projects (see notes from the incubator session below)? Observe and Reflect: What insights do you now have about your questions? What have we learnt? How do we learn? This is still the weakest link for Marine CoLAB, it needs more emphasis on 'observing and reflecting’, in order to understand how can Marine CoLAB could exist in it's own right, to become self sufficient and to design better projects. How do we evaluate projects and activities of the LAB and the CoLAB itself? 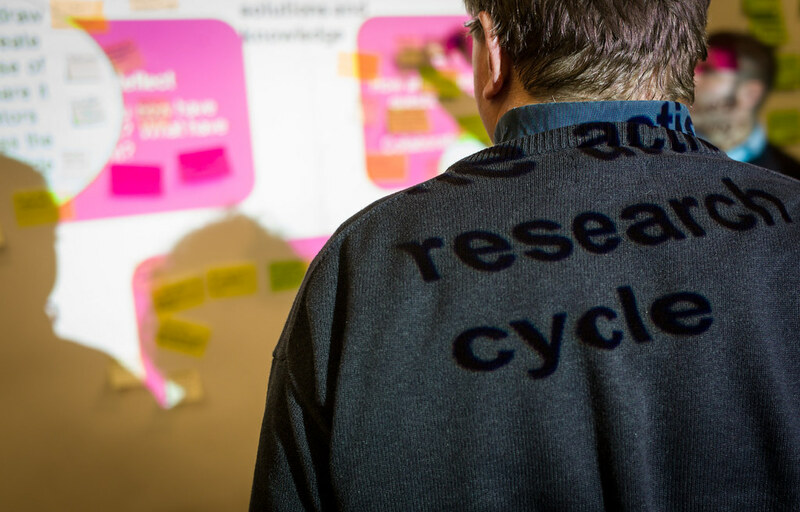 Before coming up with a plan for 2016 and a longer term strategy for Marine CoLAB in 2017 and beyond, the action research cycle could be used to evaluate the open questions, which can be tackled in the Marine CoLAB sessions in February and March, which will focus on how will we operationalise the LAB. Knowledge: questions around values, systems, the lab… which knowledge needs to be acquired from outside, etc. Plan: questions about who, what, when, how… related to membership, decision-making, targeting, communication, funding, emerging themes/challenges, etc. Action: questions about alignment of experiments, incubation, focus, emerging issues and opportunities, values based frameworks, etc. Reflection: questions related to learning, impact, evaluation, inquiry and feedback loops, sharing, dissemination, field-work, etc. Benefit of the incubator: Working with existing projects can focus conversations by working with tangible outputs. People working on the projects are excited about them and the LAB can benefit from an “Excitement transfer”. As everyone is so busy, the lab could make the most of existing opportunities, rather than overloading the group with new projects. It would help to reconcile time & engagement barriers. The incubator could be a bottom-up starting point to identify strategic lines of work. How to bring the projects together? how to create a shared agenda? how to maintain the network? Can we define what mean by Values-Based-Approach in a clearer way? Can we translate what we mean by Values-Based-Approach into a user-friendly, easy-to-remember, so that we communicate better internally and externally? How to align all these forces – projects – energies – constituencies around a common Marine CoLAB agenda? What is this agenda? what are the principles and values that underpin it? Can we co-create a common agenda together (e.g. a Marine Campaign Lab)? What infrastructure is needed (i.e. a NEON type of platform)? How do we give our diverse stakeholders a voice (i.e. a Spokesperson network trained to speak on key topics)? What could be the approaches of the MarCoLAB incubator? (Bucket #3) “Spawning projects” - Inspiring and informing others to frame values questions, start experiments, get involved with the issues, etc. The Marine CoLAB could be a place where we can design (or get help with a design) tests (experiments) that provide useful results (answers to questions) about values connecting people and oceans. A strategic device or approach is needed to decide what experiments/projects are useful for achieving the required results. If the connection between the projects is that they are a part of a values based LAB, then pick experiments that test different ideas and questions about values, and provide a context to map the results. Joint projects designed specifically by Marine CoLAB (e.g. SUPB) can function as experiments and probes. CoLAB projects or experiments start from 'gaps' in the external world and inform existing projects. Existing projects (by participating organisations) can be clarified and deepened by investigating them in the CoLAB: asking questions, providing data, making small changes in order to answer existing (values) questions. Also, the CoLAB could help 'reverse engineer' the existing projects to fit gaps for better coverage, closer alignment, more explicit values etc. The CoLAB can help align messaging, focus on synergies between individual projects. What the lab is doing can inform these projects, the projects can provide results that inform the lab (continuous feedback loop). The CoLAB can feed in projects (contributing information/data/answers), as well as reach out (asking specific questions, specific experiment, structured projects). For example, 'Common Ground' project is testing the hypothesis of whether values based approach can create more significant change. It would be a good test-case for this reciprocal learning (in/out of the CoLAB). Questions to individual organisations: Can new projects be structured to benefit from the lab? Can existing projects be modified to better fit the lab agenda? How to collect, share and analyse information during project lifetime? There are positive externalities of the lab, as forces could be more aligned for change. Action research cycle could be used to look at what can be learnt from each project, which values is it addressing, how is it working, how can its results be brought into the lab (e.g. providing advice and aggregating results from many projects). The CoLAB can be used to keep track of current progress, project delivery, emergent learning. How would this be done? What is the forum and format for discussion before, during and after the projects? A sea of change – seeing through the plastics problem. The project started with meetings in December and January. This was a session that summarised and provided an update about what has happened so far. It was aimed at the Marine CoLAB members who aren’t directly involved in the project (yet), and proposed different ways in which they could become involved or simply kept up to date. It is considerd important for the project to be embedded in Marine CoLAB, to enable reciprocal learning between the project and the lab. Roles and responsibilities have been identified. Why are we taking a systemic approach and how does this differ from a more linear model of change? Has to be quick, as the elections are in May. It focuses on the landscape around the two key candidates, and works on finding influencers (now it is clear how to go after them and who they will listen to). It is important not to prejudge the long term aims of the project. Instead of big media pushes, the campaign will focus on letting social media do its work. Lots of face-to-face contact, focusing on the message “why wouldn’t you”, targeting personal commitment (and if elected, a commitment to eradicating SUPB in their buildings, as well lowering the amount of SUPB in London. There will be 1-2 events (e.g. with Selfridges) to create noise, link to clean air (Tory) and social issues (Labor). How do you want to be updated? Do you follow the traffic on the email? Do we need to flag communications: SUPB, other projects, LAB for relevance? How do you want to be involved? How to create sufficient connection with the CoLAB? Answer: as members of the advisory committee, as ambassadors and experts. Advisory committee: Can work akin to a trustee board - questioning and oversight. Use the CoLAB as a lab to test assumptions, extract learning etc. Experts: If a specific expertise is needed for something, reach out directly to specific people. They might need more advance warning depending on the amount of work involved. DO NOT wait for people to become involved, ask specific questions. Ambassadors: Invite everyone to spread the word (in the short term: mayoral campaign); introduce people, connect to existing projects, etc. In the first year the project will focus on design, planning and research phase, so there is still flexibility in the plan and budget (core spend + flexible spend), for those who want to get involved at a later stage. How will it interact with and feed the aims of the LAB? How will the SUPB action research cycle interact with that of the LAB? What does this experiment in SUPB tell us about how we create Values based change strategies? Various opportunities are arising, how to take them on or evaluate them? In 2015 the Marine CoLAB focused on establishing and enabling the collaboration. In 2016 the aim is to start “doing it (the lab, the experiments)”, to learn what the Marine CoLAB could be like in practice. CGF would like the group to start piloting what they’ve been talking about. In order to do that a 'proto-draft' infrastructure/architecture/operating/business model needs to be designed and implemented (as an experiment) to enable quickly making decisions. This would be evaluated throughout 2016 through frameworks, analysis of the overall approach etc. How to keep Marine CoLAB going? How to create more impact? What have we learnt about setting up a LAB over the last year? What do we not know? In relation to each part of the AR Cycle, esp. LAB purpose? What questions do we still want to ask? The workshop on the 11th of February 2016 will focus on creating a workplan for 2016. It will begin by looking at where the group wants to be at the end of the year and working backwards. The aim for the meeting is to produce clear outcomes, activities (projects, experiments, meetings, etc. ), an operational plan ('how do we organise ourselves') and suggestions how to reflect and evaluate the CoLAB and its activities. CGF may have some suggestions (e.g. TOC, logframe analysis, dynamic systems mapping, etc.). During this workshop it should be clear which questions cannot be answered from the group and which external people might be good to involve (as speakers, advisors, consultants…), in order to address issues related to planning and strategy. One session should be devoted to “doing the lab”, e.g. better aligning one of the existing projects (e.g. MCS’s Common Ground) with the CoLAB’s values work. There is a possibility that a business consultant could participate in a part of this workshop, to meet the group and understand the CoLAB (TBC). The workshop on the 3rd of March will build on the plan for 2016 and look at a longer term operating and business model, including governance/decision-making, transitional strategy, value propositions, funding and operations. The agenda will be finalised in February. Giles and Aniol: group the existing questions, particularly ones focusing on planning and strategy. Aniol will send an email to everyone about the information that needs to be compiled before the workshop. Vali: assist with creating and finalising the agenda before the 11th of February. Louisa: find out if the consultant will be involved in this and/or the March workshops, and what the scope of their involvement will be in creating the business plan for Marine CoLAB. Heather, Sue, Nic: write a paragraph on how Marine CoLAB has benefited their work and life so far.